Japan is a country full of instructions. The problem is most of it is in Japanese. Learn these key phrases to navigate the city like a native. Japan is full of instructions. At least, that’s how it seems to me when I first arrived from the UK. Back in London, there might be a sign telling us to be careful on an escalator; in Japan, there will be sign, but the escalator may also start talking to us, just in case. I’m still making my peace with elevators in Japan. I’ve seen far too many people rammed by doors that are inexplicably not equipped with (working) motion sensors. There is also the unspoken elevator etiquette. If you’re standing by the control panel, you have the greatest responsibility: hold down that open button for people to get on and off, and then press the close button for a swift departure to the next floor. Given the widespread tendency to ignore push/pull signs in English, I’m not sure how useful the following kanji will be, but in theory they should help you open doors like a smooth operator. If you see 止, you are not allowed to do something. This is often written as 禁止(きんし) which translates as prohibition or ban. You will see it everywhere – learn it fast. Of course, there are many things that you are allowed to do – like visit the restroom or drink from the water fountain. It’s just sometimes these things aren’t working. Although another crackdown on cyclists has recently been announced, cycling laws seem to be randomly enforced in Japan, which means that many cyclists ride however they please – on the pavement, off the pavement, and –terrifyingly – on the wrong side of the road into traffic. Which, of course, contains the all important 止. At many places likes museums, where you buy your entrance ticket will be a different place from where you enter, and so proudly identifying 入り口 and marching towards it will likely get you turned away. 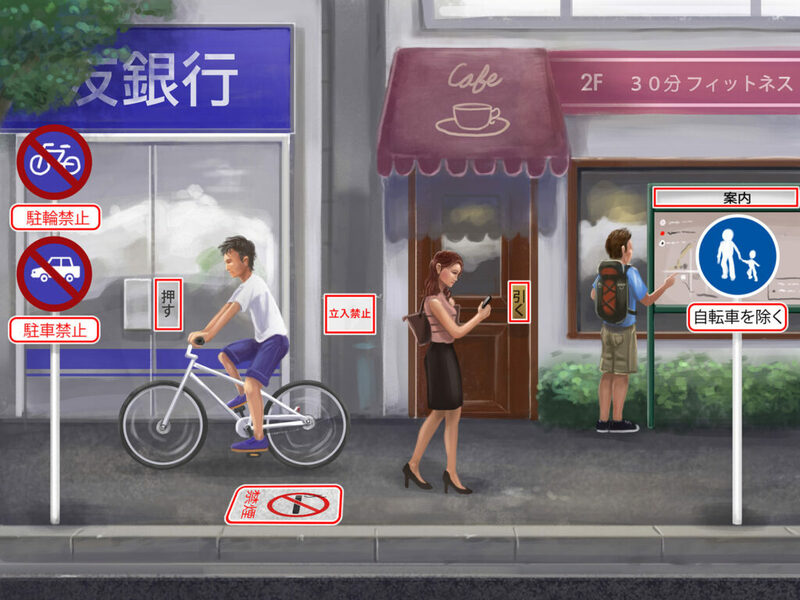 You may spot 案内 for information or 受付 for reception. But things are a little more complicated when it comes to where you buy your ticket as there are several variations depending on where you are. Look out for 入(いり) combined with 券(けん) for ticket and/or 売場(うりば) for ‘sales place’. The next challenge is to correctly identify the type of ticket you need and therefore how much the 入浴料金 (にゅうよくりょうきん) (entrance fee) will cost you. Adults will be listed as 大人 (おとな) or 一般 (いっぱん) which just means ‘general’. Since everyone loves a discount, it’s worth learning these kanji to see if you or your kids are eligible. Sometimes, studying Japanese pays off – literally.